Australia’s Impressionists focuses on the paintings of Tom Roberts, Arthur Streeton, Charles Conder, and John Peter Russell. All were key players in a distinctively Australian art movement that drew on influences ranging from Whistler’s subtle Nocturnes to the European tradition of plein air painting, and revealed Russell (who spent his working life in France, embedded in the avant garde) as one of the outstanding colorists of his time. 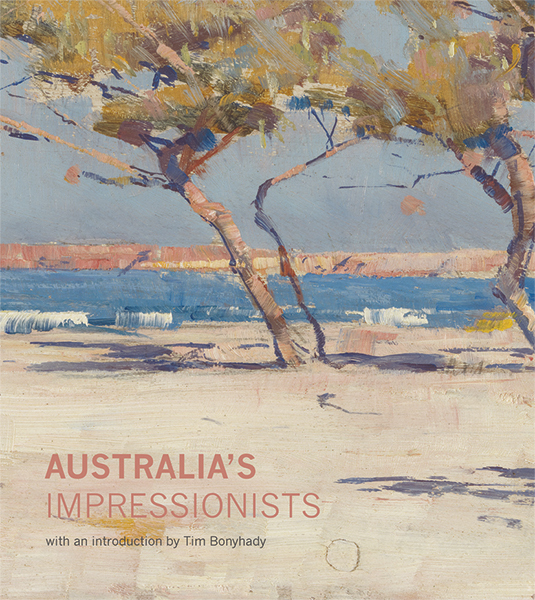 This beautiful book challenges our preconceptions of what is meant by Impressionism, enriches our understanding of Australian art, and reveals the international nature of art-historical movements and exchanges in the 19th century. The story is framed by unmistakably Australian subjects and locations, by a preoccupation with light and color, and in the context of Australian identity and sense of nationhood. Christopher Riopelle is curator of post-1800 paintings and Allison Goudie is Harry M. Weinrebe Curatorial Assistant, both at the National Gallery, London. Tim Bonyhady is an Australian lawyer, cultural historian, and author. Sarah Thomas is lecturer in the art of the 19th century, Birkbeck College, University of London. Alex J. Taylor is assistant professor of history of art and architecture, University of Pittsburgh. Wayne Tunnicliffe is head of Australian art at the Art Gallery of New South Wales, Sydney.